Seville is a popular tourist destination in Andalusia; the city has the largest old town in Spain, only comparable to others in Europe as Venice or Genoa. 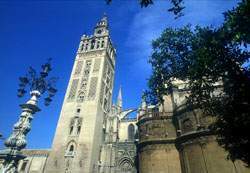 Seville offers a cultural tourism where you can visit monuments such as the Giralda and Torre del Oro. It is a city within the region of Andalucia but with a marked difference in both the accent of the people and the layout of the streets with the rest of Andalusia. The name of the city comes from Ispal, a village located on a small island in the Guadalquivir River. The city was founded by the Tartessians and conquered by the Romans in 206 before our common age. It was the Romans who called it Hispalis; already in the first century before our common age the city was walled and had an important port activity. The Arabs, with a short reign compared to the rest of Andalusia, adapted the Roman name to their phonetic giving the city the actual name of Seville. The Kings of Castile conquered Seville in the middle of the thirteenth century and after the discovery of America the city became a major economic centre for centuries to come, with important buildings such as the Archivo de Indias, where was centralized documentation regarding the Spanish colonies, and other monuments we will talk about further below. The city with the largest number of listed monuments in Europe offers an endless array of possibilities. The aforementioned Archivo de Indias, the Giralda, the Alcazar and one of the largest historical centres of Spain are certainly a great incentive for anyone who wants to know the culture of this Andalusian province. Another of the main attractions for tourists in Seville are the festivals and celebrations, being Holy Week and the April Fair known throughout Spain; very popular events with a large amount of visitors coming from everywhere in the Peninsula. If you like history and archaeology, you should not miss the opportunity to visit Carmona, a city situated 33 kilometres from the capital city with great historical and architectural heritage. Seville has a commercial port situated 80 kilometres from the mouth of the Guadalquivir River, the only one in Spain, but lost importance since the early eighteenth century when most of its activities with the Indies were moved to Cadiz. Seville Airport is situated 10 kilometres from the city and has a large number of passengers, though far from other cities like Malaga or Madrid. Origin of the first high-speed line in Spain linking Madrid with Seville since 1992. Trains depart from this station to Malaga and Cadiz among other destinations, one of the major railway stations. Distance from Seville to Malaga: 209 km. Seville to Cadiz: 123 km. Seville to Cordoba: 143 km. Seville to Granada: 259 km. Seville to Almeria: 409 km. Seville to Huelva: 91.2 km. Seville to Jaen: 254 km. The best means of transport to get to Seville from Malaga are the train and car. If you've opted to rent a car in Malaga you should take the road to Antequera until joining the A-92 which after passing through Estepa and Osuna will lead to Seville. The journey from Malaga to Seville takes about 2 hours. The journey by train from Malaga to Seville takes about 3 hours; it is a very nice trip with beautiful panoramic views of El Chorro. 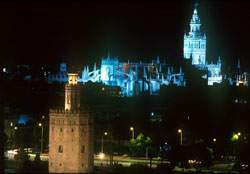 Another option is a taxi from Malaga to Seville; you can check the prices following the link.